Marketers are struggling to fill positions with qualified employees, and industry leaders are taking action. Photo courtesy of PERC. 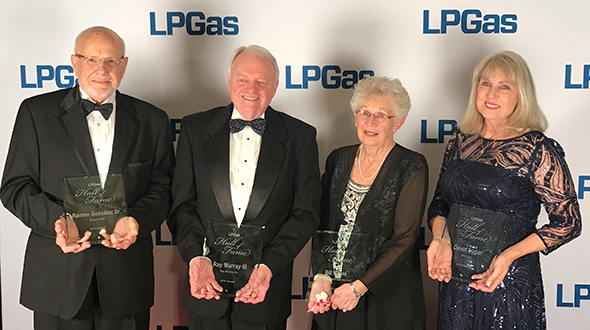 From his experiences traveling the country and attending meetings and conventions for nearly 30 years, Phil Farris has come to realize one integral detail about the propane industry: The people are its backbone. They are the fathers, the mothers, the family members, and the employees who seem like family. They are the mentors, close colleagues and friends. But what he’s been hearing lately from propane marketers isn’t so settling. “What we’ve heard is that we’re running out of propane people,” says Farris, a senior sales and marketing representative for the Southeast U.S. at Plains Marketing LP. Sixty-five percent of survey respondents say they have trouble finding qualified employees. Image courtesy of LP Gas. Younger generations are being raised differently today, and they believe there are “easier,” more “exciting” ways to make a living, Farris says. Plus, many of these young employees weren’t raised in the propane industry, so it’s become more difficult to pull them in. 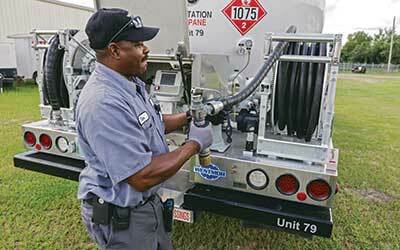 A plan to pursue the next generations of employees has become a priority for the propane industry. Leaders from national and state organizations and the companies that comprise the industry are uniting to find ways to attract and retain new employees, at a time of heightened competition among industries for available talent. Propane leaders’ end goal is to build a workforce of the future that will help to stabilize and grow a century-old industry. 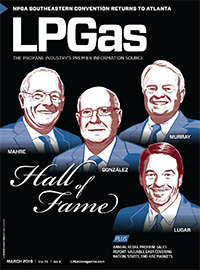 Industry surveys, including one of LP Gas magazine readers, confirm the messages resonating from propane leaders in their hometowns and communities, at meetings and conventions: Companies are struggling to find and retain good employees. 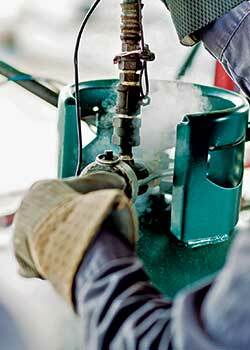 LP Gas magazine readers say delivery drivers and service technicians are in high demand at their propane operations. Photo courtesy of PERC. 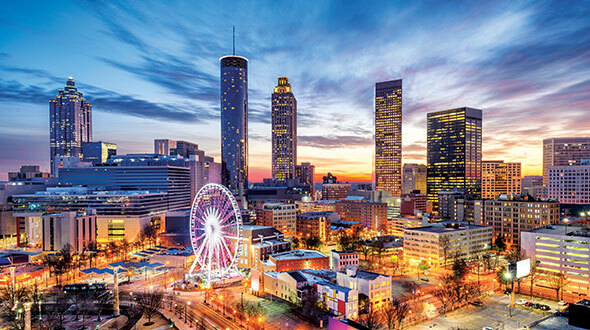 A Propane Education & Research Council (PERC) survey, with about 450 respondents representing companies from all 50 states and ranging from two employees to more than 8,000, reveals the struggles taking place across the nation. Four out of five respondents say it’s either difficult or extremely difficult to find drivers and technicians. While the worker shortage is impacting drivers and technicians – 75 percent of the PERC survey respondents say that only 10 percent of their drivers and technicians are under 30 years old, and 50 percent of respondents say they will need to fill these positions in the next three to five years due to the age of the current drivers and technicians – the effort to attract new employees is being made across the board. NPGA and PERC have combined their resources to address the issue. The association formed a workforce development task force and met for the first time in early 2017. PERC followed by forming a workforce recruitment project team. More than 30 industry volunteers comprise both groups. Efforts at the national level are designed to provide tools and programs that propane marketers can leverage in their own businesses to recruit employees, including young, first-time job seekers, military veterans, career transitioners and part-time seasonal workers or retirees. To build a workforce of the future, propane marketers must promote employment in the industry as a desirable career option. Photo courtesy of Westmor. PERC is showing its support for workforce recruitment initiatives by funding projects related to the issue. The council approved $500,000 at its November meeting for a 2019 workforce recruitment pilot program, which will provide resources for grassroots initiatives to help recruit drivers, technicians and other sought-after employees. The program will offer grants of up to $50,000 to state entities. Also at its November meeting, PERC approved $250,000 for a North Carolina Propane Gas Association pilot program that will allow for the creation of a technician/driver task-based training school in North Carolina geared to place graduates into the propane industry (see sidebar at left). The project is one example of several state propane associations that are taking steps to address workforce challenges. “Any workforce development initiative really needs that grassroots effort, that state engagement, that person on the ground who champions the programs,” Kuster says. PERC took a first step toward creating content and programs for marketers and state entities to use in workforce recruitment activities by approving $250,000 at its July meeting. 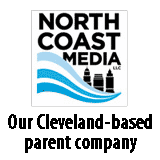 The content will include industry-related brochures, videos and other materials that marketers or state associations can use in their outreach to workforce boards, technical/trade schools and colleges. The council plans to direct stakeholders to propane.com. 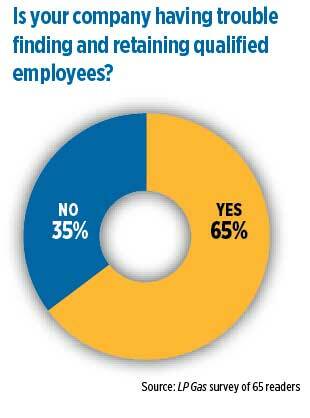 A little more than half of the survey respondents say workforce development is a recent issue. Image courtesy of LP Gas. The propane industry is not alone when it comes to facing employee-hiring challenges, which is why leaders are considering ways to improve its image to promote employment in the propane industry as a desirable option. Kuster says other non-propane industry organizations have been talking about workforce development for years, even using materials to target students at the middle school and high school levels. Developing strategic partnerships with key groups, such as the National Association of Workforce Boards, the Association for Career & Technical Education and The Office of Apprenticeship within the U.S. Department of Labor, is part of the plan to leverage industry assets and boost propane’s standing, he adds. 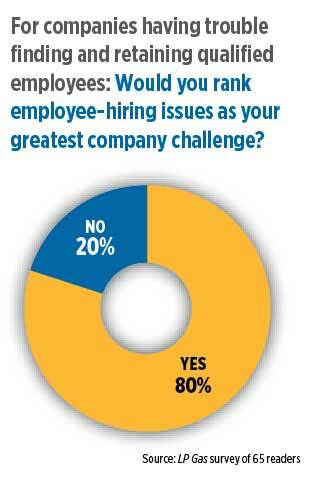 Eighty percent of respondents rank employee-hiring challenges as their greatest company challenge. Image courtesy of LP Gas. For the propane industry to thrive in a delivery-focused line of work, it must recruit, retain and train drivers of the future. It’s doing this in part on the legislative side by supporting the DRIVE-Safe Act, a House bill geared toward providing economic opportunities for younger truck drivers looking to enter the workforce. While most states allow for issuing commercial driver’s licenses at the age of 18, federal law restricts drivers under the age of 21 from crossing state lines. The DRIVE-Safe Act would remove this regulation for individuals who complete a two-step apprenticeship program, with the goal of building the truck driving pool before the young job seekers choose other career paths. NPGA and industry members lobbied for the bill during Propane Days this year. 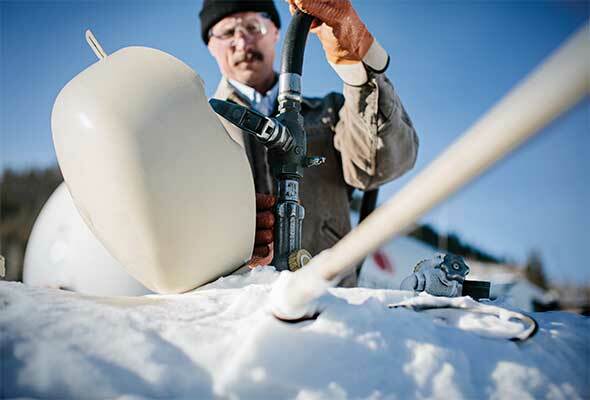 For the industry’s efforts to net successes, propane marketers and state associations will have to play an active role, project leaders say. Marketers can boost their workforce by reaching out to secondary educational facilities, technical and trade schools, and community colleges, where they can find people who are seeking education and training, and ultimately a career, Kuster says. 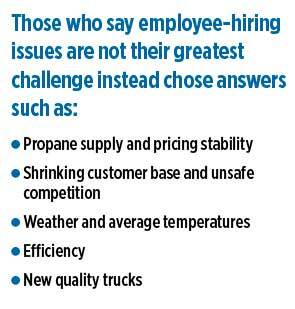 There were five other topics propane retailers ranked as challenges for their company. Image courtesy of LP Gas. It’s also imperative for marketers to understand the needs of today’s job seekers, Kuster says. Understanding those needs, he adds, will allow marketers to adjust their philosophies and businesses in a way that will help draw employees. Workforce development and recruitment must become another facet of propane marketer operations because, Bimson Maggi says, this isn’t a one-and-done issue. 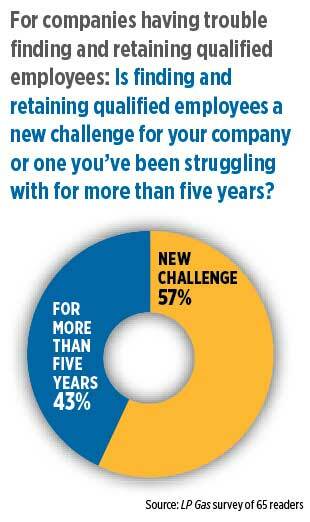 How does your company successfully find and retain qualified employees? Preparing students to have an immediate impact on the propane industry is the goal in Georgia to answer workforce development questions. Jennifer McKeen, executive director for the Georgia Propane Gas Association (GPGA), explains the association is working alongside PERC, the U.S. Department of Labor and the Georgia Department of Labor to develop curriculum and an apprenticeship program in all 22 technical schools in the state. Mike Davis of Georgia-based Davis Propane, McKeen explains, has been spearheading the state’s efforts. Davis started working with Darrell Whatley of Georgia-based Spalding Gas to obtain furnaces from Lennox Distributors, an HVAC company, for training in all Georgia technical schools. Today, through a partnership with water heater company Rinnai and a track record of success, GPGA is continuing to develop curriculum that educates interested candidates on water heating, HVAC and the propane industry. Education programs eventually will expand to CDL training. McKeen explains the hope is to prepare students to be an immediate impact on the propane industry after graduation. “The idea is [students] come out of school and are prepared to work for propane marketers under some supervision for a period of time,” she says. Hands-on instruction is a key component of the education strategy, and an apprenticeship program is in the works to create a well-rounded education program. A program like this has the ability to make a nationwide impact. 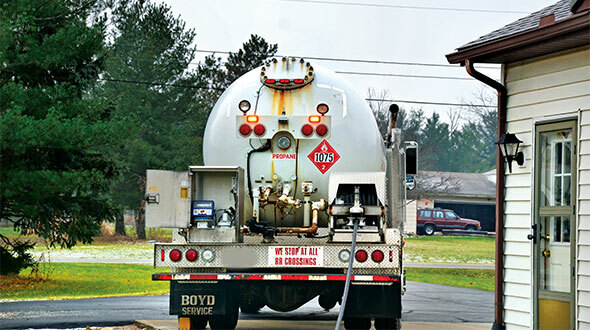 The North Carolina Propane Gas Association (NCPGA), the Propane Education & Research Council (PERC) and Lenoir Community College are combining to fuel a workforce development push in North Carolina. The North Carolina Propane Gas Association has a partnership with Lenoir Community College to provide industry education. Photo courtesy of Lenoir Community College. Through a partnership with PERC, the NCPGA plans to establish NC-TEC – a school located in central North Carolina that will feature an eight-week class aimed at training the next wave of propane industry professionals. 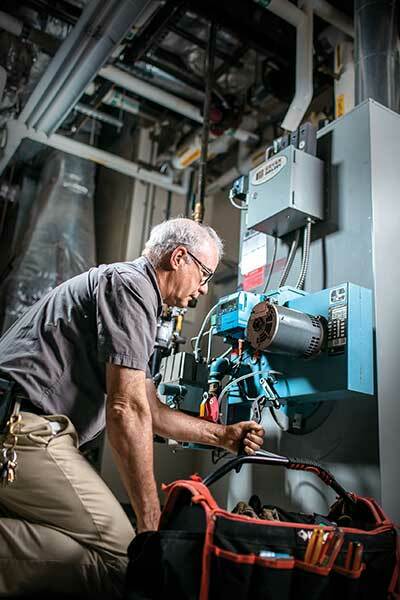 “We are building a school specifically to recruit and train interested candidates to be service technicians in the propane industry,” says John Jessup, executive director of the NCPGA. PERC approved $250,000 for the pilot program to establish the school that features task-based training geared toward placing graduates into the propane industry as service technicians and drivers. The NCPGA plans to have the school built and operational by the end of 2019, Jessup says. 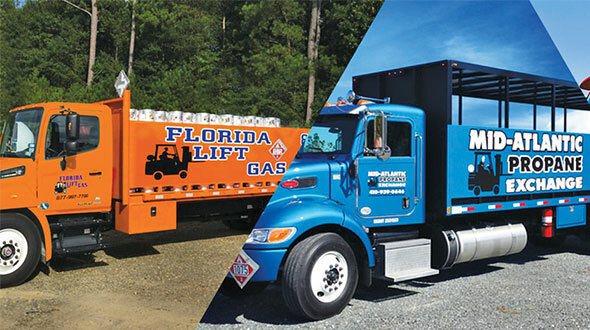 “Creating a task-based training school that is specifically designed to place quality graduates into the propane industry will be the most direct and effective way to address that workforce shortage,” says Phil Farris, senior sales and marketing representative for the Southeast U.S. at Plains Marketing LP. NC-TEC will have two classrooms, two indoor labs and two outside labs capable of training 12-24 students at a time over four eight-week sessions throughout the year, Farris explains. A 12-member NCPGA workforce development committee will develop a school floorplan for classrooms and labs, along with construction and equipment needs. What can the industry do to attract new employees? According to Leslie Anderson, president and CEO of the Propane Gas Association of New England (PGANE), recruitment and workforce development are top of mind for association members. Empowering current members of the propane industry is a key to addressing this crisis in New England. Anderson explains the association’s standing Recruiting Committee, which tackles workforce development challenges, is developing packages that can be taken into job fairs, career days or other recruiting events to better prepare members to speak about the propane industry. These packages would include flyers on the benefits of working in the industry, a visual presentation of the industry and other materials association members can use in recruitment efforts. For job fairs, PGANE would provide material to display or hand out to attendees along with tips for industry members on what to wear, conversation topics and how to answer common questions. In addition, Anderson hopes to have a virtual reality component to training efforts, providing a first-hand look into the propane industry while at a job fair. Vets2Techs is a unique program that seeks to place retired military personnel in jobs within the propane industry. The program serves the dual purpose of helping develop the propane industry’s workforce while also giving deserving men and women a chance to join an industry in which their skills are necessary and valued. “There are all these organizations at state and national levels about educating and attracting a younger workforce. One of the things that never came up in those conversations was veterans,” says Jesse Lord, a veteran and account executive at A.R.M. Solutions. Lord helped launch the program along with Gerry Brien, Sgt. Jon Skipper and Lou Verruso. Since joining forces, the group has been working to promote the organization to veterans. The program works fairly simply. Employers – i.e. propane retailers – create an account and post available jobs on the Vets2Techs website (Vets2Techs.com). Veterans then use the same website to view the job postings and connect with employers. The program also aims to educate propane retailers on the types of benefits their companies can receive by hiring veterans.